I’m sure it’s been said before, but as a short-term resident of Louisville and bike-dependent person, I figure it’s worth pointing out again: Downtown Louisville Management District sculpture bike racks are a real mixed bag. Many are beautiful. Fewer are functional. Fewer still are both. As Dave Morse has pointed out at CART, there are an abundance of standards for bike parking. These standards are intended to establish a minimum level of functionality across the broad spectrum of bike parking. The proliferation of such standards has helped the bike parking situation around this country. Of course, these standards are often ignored in attempts to turn what should be a simple piece of public infrastructure into pieces of art. Bikes are probably the only mode which have to endure any significant variance in how their infrastructure is implemented, particularly variances that affect basic functionality. Motorists don’t have to try parking in architecturally intriguing parking garages for which the entrance is too short to accommodate 90% of vehicles. Pedestrians (usually) don’t have traverse beautifully painted crosswalks which only go half way across a street. Airports don’t build beautiful concourses and gates that don’t have jetways to reach the planes. Yet cyclists in Louisville indulge “bike racks” which may only accommodate long cable locks (the least theft proof), are only appropriate for children’s bikes, block walking paths when occupied, are easily vandalized in order to detach a bike, or in the worst case simply don’t offer anything to lock to. 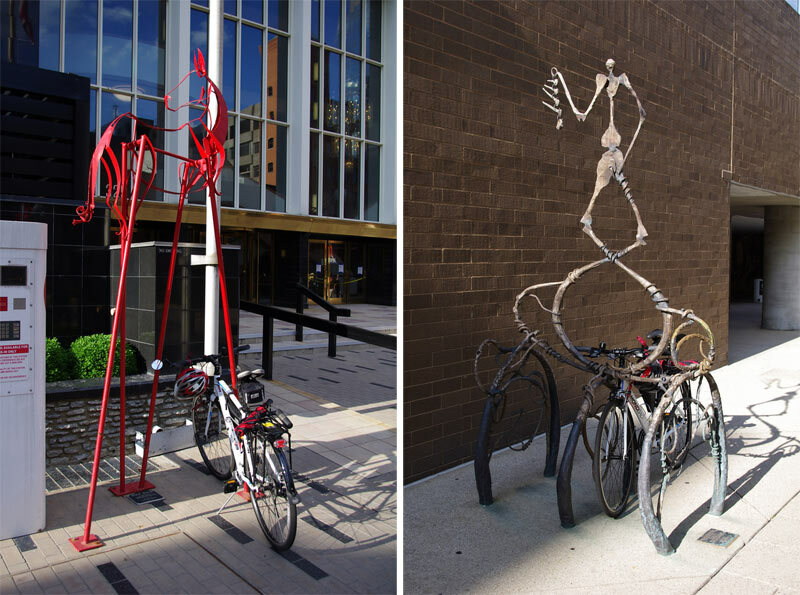 Bike racks don’t have to be boring. But, the necessary level of functionality has to constrain creativity at least somewhat. Otherwise the result is both street sculptures and bike racks which aren’t particularly good examples of either. What’s more, you endanger works of art by inviting vandalism in order for thieves to make off with stolen bikes. Ever wonder why it’s a bad idea to lock a bike to a tree? Agreed! “Art” bike racks are… 1) often commissioned and designed by non-cyclists, with great ambition towards improving the urban space but little or no thought towards function; 2) not easily identifiable as bike racks, meaning that a cylists may go elsewehere for fear of locking to legitimate art pieces; and are 3) often more expensive and thus poor prioritization over getting simple racks placed at more locations. Beautiful infrastructure can be achieved through simple functionality and widespread dependability. The system should be artful, not just each piece. This happens all the time. ArtWorks in Cincinnati has been designing some colorful and artful bike racks, except they cost a lot of money. The last rack that was installed in front of my old apartment complex – which is a huge rack, can only hold 2 bikes at most because of the way it was designed and the area it was installed in. It backs to a wall. To get more bikes onto the streets, intall the standard upside-down “U” racks in front of businesses that people will want to bike to. It’s more cost effective and just as visible.